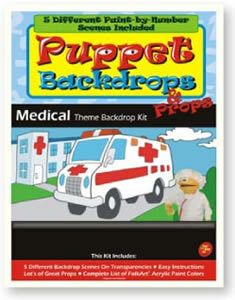 Adding a backdrop helps create a scene or environment that makes your puppet skit more effective and fun. Backdrops and props enhance the atmosphere in which the puppet performs. In this kit, we will assist you in understanding how to make cost effective puppet backdrops, including the steps to buy, assemble and paint visually impacting backdrops and props. complete list of FolkArt® acrylic paint colors. You make your backdrop what ever size you want.The kit come with an overhead sheet that has the art work on it. When you put it on the over head projector, you can make it what ever size you would like to have it. © Copyright 2019 The Puppet Factory, Inc. All Rights Reserved.